~ a girl. the city. her kitchen. Oh man, this dip takes me back. And it’s every bit as good as I remember. Get creative with presentation: serve as an appetizer, spread it on sandwiches, use it as a topping for other veggies. Also, switch up the cheeses according to your preferences. Greek yogurt can also be substituted for the sour cream. 2. In a large pan, drizzle olive oil then melt 3 tablespoons of butter over medium heat. Add garlic and cook til softened. 3. Raise heat a smidge and stir in spinach. Season with salt and pepper then cook for a couple of minutes to meld flavors. 4. Remove the spinach and garlic from pan and set aside. 5. Discard excess liquid in the pan and then add artichokes. Saute over medium high heat until artichokes are lightly browned. Remove from pan and chop coarsely. Set aside. 6. In the same pan, melt remaining 3 tablespoons of butter, then whisk in flour, making sure all clumps dissolve. 7. When roux is thickened, pour in milk and sour cream and whisk until a sauce has formed. Add Neufchâtel, feta, half of the Parmesan and stir until cheese is completely melted. 8. Stir in artichokes and spinach. 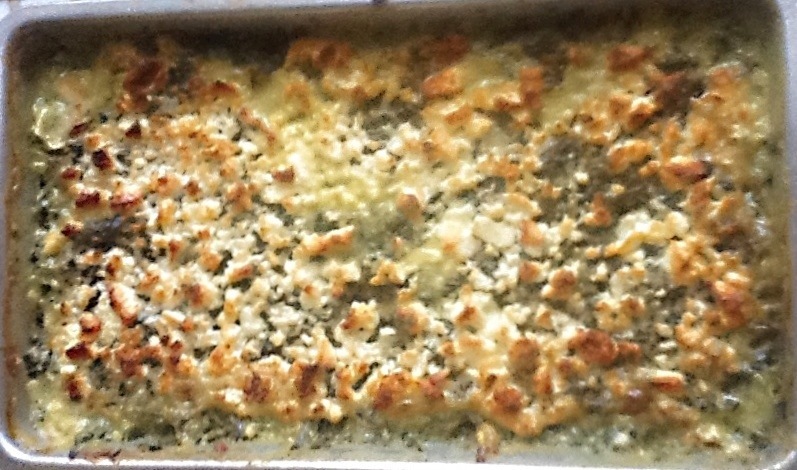 Pour into buttered baking dish and top with reserved Parmesan. Bake for 15 minutes, or until cheese is melted and golden. Serve with French baguette slices!